Senior Fantasy Baseball Expert Shawn Childs previews every single batter and pitcher on the Tampa Bay Rays as we approach the 2018 MLB season! Get ready to DOMINATE! After a nice run over six seasons from 2008 to 2013 where the Rays made the playoffs six times with one World Series appearance, they’ve missed the playoffs in each of the last four years. The strength of their team in their best season has been their pitching staff. Last year Tampa was fourth in the AL in ERA (3.97) with nine fewer runs allowed than 2016 (713). They finished eighth in bullpen ERA (3.83) with the second most saves (53) in the majors. The Rays lost SP Alex Cobb to free agency, but they should have enough talent on the minor league roster to fill that void. Overall, their starting rotation has one ace (Chris Archer) and three arms with upside (Jake Odorizzi, Blake Snell, and Jacob Faria) if healthy. The bullpen will have multiple questions behind closer Alex Colome. The Rays placed 5th in the AL in home runs, but they scored the second lowest total of runs (694) with a poor batting average (.245). Even with a decline in runs, they did score 22 more runs than 2016 (672). In the offseason, Tampa lost 1B Lucas Duda, 1B Logan Morrison, 3B Trevor Plouffe, and OF Peter Bourjos to free agency. Morrison was the only player of these option on the roster all season. Tampa acquired OF Denard Span, P Matt Krook, P Stephen Woods, and 3B Christian Arroyo in a trade with the Giants for 3B Evan Longoria. The Rays added 2B Joey Wendle and 3B Brandon Snyder in a couple of minor trades. All options will compete for roster spots in spring training. In mid-February, the Rays acquired C.J. Cron from the Angels for a player to be named later. They also signed OF Carlos Gomez while trading SP Jake Odorizzi to the Twins. Overall, their offense is well below the league average with plenty of regression expected in power. The pitching staff will keep them in many games, but the long haul of the season will lead to losing record and another missed playoff berth. Over the last six years, Span has a tight range for his CTBA (low – .305 and high – .336). He did show a spike in his average hit (1.570) in 2017 giving him a chance at 15+ HRs with over 550 at-bats. Denard tends to have a league average walk rate (8.5) while being tough to strikeout (12.7 percent in 2017). Last year he missed a couple of weeks late in April and early in May with a right shoulder injury. His bat had no value vs. lefties (.226 with no HRs and nine RBI over 106 at-bats) suggesting a platoon role in 2018. Span improved his swing path in 2017 leading to a drop-in ground balls (45.0 – 51.7 percent in his career) and a career-high FB rate (33.6 – 26.6 percent in his career). Only a steady backend OF option with a chance to hit a career high in HRs with fading upside in speed. About a .270 hitter with 75 runs, 10 HRs, 50 RBI, and 10 SBs. I’d look elsewhere for upside. Only a short-term injury cover. Kiermaier has been injured in each of his last two seasons leading to 121 missed games. Last year he missed two and a half months a broken hip. Over his first 233 at-bats, he hit .258 with seven HRs, 20 RBI, and ten SBs. This pace was below his expected value. His bat was much more attractive over his last 147 at-bats (.306 with eight HRs, 19 HR, and six SBs). Kevin did lose some of his approach at the plate in 2017 (K rate – 23.5 and walk rate – 7.4). Kiermaier handled himself well vs. RH pitching (.289 with 11 HRs and 19 RBI over 239 at-bats) with enough success against lefties (.255 with four HRs and 20 RBI over 141 at-bats) to be in the lineup every day. Even with a career-high HR/FB rate (16.7), his swing path (GB rate – 49.6 and FB rate – 32.1) regressed for his 2016 gains (GB rate – 41.8 and FB rate – 37.6). Great defensive player with enough batting skills to be a neutral hitter with 20+ HRs and 20+ SBs. HIs RBI rate (12) points to lead off or bottom of the order value. Don’t overpay for his complementary value as he still needs to prove himself over a full season. Gomez hasn’t been able to play a full season since 2014. Over the last three years, Carlos hit .247 with 157 runs, 42 HRs, 160 RBI, and 48 SBs over 1,214 at-bats. His production still gives him a 20/20 skill set with a full-time job. Over the last two seasons, Gomez had huge failure in his K rate (29.9 – 23.9 in his career) while doing a better job taking walks (7.4 percent). In 2017, his best value came against RH pitching (.264 with 15 HRs and 36 RBI over 280 at-bats). Carlos landed on the DL three times last year (hamstring, right shoulder, and ankle). His free swing approach isn’t a great for a team like Tampa who want their players to take walks. Worth a flier for a Fantasy owner who is chasing speed. I don’t expect a starting opportunity, but Gomez will hit in a favorable part of Tampa’s lineup on many days. Possible .260 with 15+ HRs and 20+ SBs with 450+ at-bats. Cron remains a frustrating player to own in the Fantasy market. The Angels just won’t commit to him every day, and he hasn’t helped himself with slow starts to the year. Over the first seven weeks of 2017, C.J. only made 22 starts leading to a poor start to the year (.232 with one HR and eight RBI over 82 at-bats) and a trip back to AAA. In the minors, he hit .268 with four HRs and 23 RBI over 82 at-bats. When back in the majors, Cron still offered no value over his next 40 at-bats (.175 with one HR and six RBI). After the All-Star break, he hit .267 with 14 HRs and 42 RBI over 217 at-bats. Last year his K rate (25.7) was below his below his major league average (19.8) with some growth in his walk rate (5.9). C.J. had power against lefties (six HRs and 17 RBI in 86 at-bats), but he only hit .233. His swing still graded below the league average vs. RH pitching (.253 with ten HRs and 39 RBI over 253 at-bats). Over seven seasons in the minors, Cron hit .289 with 71 HRs, 328 RBI, and 15 SBs in 1,572 at-bats. Last year it appeared that C.J. tried to hit too many HRs, which led to a higher fly ball rate at AAA (55.1) and the majors (44.7). There’s a 20/80 hitter here with even more upside if given 500+ at-bats plus his batting average should be an asset. The structure of the Angels’ roster in 2018 looks to put him in a platoon role out of the gate. More of DH flier in deep leagues while keeping an open mind on his potential to breakthrough with 30+ home runs if given an everyday starting opportunity. Update: The trade to the Rays does give Cron a chance at starting at-bats if he swings the ball well. I view this move as an upgrade in role setting the stage for a 20/80 type season with 500+ at-bats. With a full season under his belt and the first base job up for grabs in 2018, Bauers could be the front-runner to win the job in spring training. Over five years in the minors, Jake hit .276 with 47 HRs, 304 RBI, and 45 SBs over 2,022 at-bats. Last year he hit .263 at AAA with 13 HRs, 63 RBI, and 20 SBs over 486 at-bats. Bauers had a high walk rate (11.3) with strength in his K rate (16.5). Line drive hitter who needs growth in both his CTBA (.342) and AVH (1.563) to deliver impactful at-bats in the majors. His speed plays well for his position. Backend option upside in deep leagues while being just a swing path change away from a jump in home runs. Let’s set he bar at .275 with 15 HRs and 15 SBs with 500+ at-bats. Miller was a waste of a draft pick in 2017 in Fantasy leagues. His AVH (1.676) fell back to his recent resume before his jump in power in 2016 (30 HRs with a 1.985 AVH). His fade in CTBA (.298) and step back in his K rate (27.0 – 24.8 in 2016). Brad did set a career high in his walk rate (15.5) by a wide margin. He struggled vs. both RH (.195) and LH (.220) pitching. There wasn’t a month in 2017 where Miller hit over .230. HIs HR/FB rate (10.8) was almost half of 2016 (20.4). After the season, he had surgery to repair an abdomen/groin issue. This season Miller will only qualify at 2B. His swing does have power and his minor league resume always projected to a much higher batting average (.334). Worth a bench flier especially with a bounce in his bat in spring training. After missing almost three months of the season with his recovery from an ACL injury, Ramos returned to action on June 24th. The Rays limited his at-bats (37) over the first three weeks (ten games over 24 days) leading to three HRs and ten RBI. Wilson proved to be out of game shape based on his empty stats from July 18th to August 13th (.127 with one run, no HRs, and three RBI over 63 at-bats). He finished the season with an uptick (.343 over 108 at-bats with eight HRs and 22 RBI), but he only played half of his team’s games over the second of September. In 2016, Ramos had his best mental approach at the plate in his career in 2016 leading to his best season by a wide margin in batting average (.307). His CTBA (.367) was well above his previous three years (2013 – .318, 2014 – .320, and 2015 – .291), but it regressed in 2017 (.314). His AVH (1.722) last year improved for the third straight season. Wilson is still a high-volume GB hitter (54.1 percent). His HR/FB rate has been strong in the last two years (21.4 and 20.8) an improvement over his 2014 (16.7) and 2015 (15.8) seasons. Ramos had a slight step back in his approach in 2017 (K rate – 16.1 and walk rate – 4.5). Slow footed power hitter that hits a lot of ground balls. His strong RBI (19) should give him a chance to hit in a favorable part of the batting order when he’s playing well. Possible .265 with 20+ HRs and 75+ RBI with 450+ at-bats. Health was the downfall of Duffy in 2016 and last season. He landed on the DL in mid-June in 2016 with an Achilles injury that required surgery after the season. Last year Matt only had eight at-bats in the minors due to season-long battle with his recover from his left heel issue. In 2016, he struggled in April and May (.242 with two HRs, 13 RBI, and seven SBs in 198 at-bats). When Duffy returned to health in August with Tampa, Duffy hit .276 over 76 at-bats with minimal production (one HR and seven RBI). His season ended in September when he had surgery on his left Achilles. Over five years in the minors, Matt hit .303 with 13 HRs, 137 RBI, and 55 SBs in 973 at-bats. His swing produces a ton of ground balls (51.1 percent in the majors) with a questionable HR/FB rate (7.7). He projects as a .280 hitter with a 10/20 skill set. The key to his upside with be his ability to hit home runs and full recovery from his Achilles injury. Hechavarria missed two and half months of the season with Miami due to an oblique injury leading to a trade to Tampa. Over his first 20 games in Florida, Adeiny hit .277 with one HR and six RBI over 65 at-bats. With the Rays, he hit .265 with seven HRs, 24 RBI, and four SBs over 265 at-bats. HIs K rate (20.6) was a career high while continuing to have a weak walk rate (4.3). His quest to hit more HRs led to career high HR/FB rate (9.6 – 3.8 in his career), but he still has low fly ball rate (31.8). With Willy Adames not be that far away from the majors, Hechavarria will have a short window to earn the starting job with the Rays. Low value player with no starting value long term. Smith hit .273 over the first eight games in Tampa with three SBs, but a hamstring injury put him on the shelf for second half in April and then a trip to AAA. Tampa called him back up on June 9th. Over his next 25 games, Mallex hit .354 with 19 runs, one HR, five RBI, and eight SBs. From that point on over the next six weeks, Smith only hit .210 with one HR, six RBI, and five SBs over 100 at-bats leading to trip back to AAA and a minimal role in September (.216 over 37 at-bats with no HRs and no SBs. At AAA last year, he hit .264 with three HRs, ten RBI, and 21 SBs over 186 at-bats. HIs K rate (22.0) is above the league average and too high for his type of skill set with a league average walk rate (8.2). In his career, Smith hit .294 with 16 HRs, 124 RBI, and 251 SBs over 1,737 at-bats. Elite base stealer with sneaky value in same games in power. His lack of success in the majors vs. lefties (.165 over 91 at-bats with four RBI and three SBs). Base stealer in waiting, but he may be a tough ride over the long haul. With 450 at-bats, 50 SBs is well within reach. At age 21, Adames has already spent five seasons in the minors while making only one step up per season. He hit .268 in 2,038 at-bats with 34 HRs, 247 RBI, and 49 SBs. Willy does a nice job taking walks (12.7) while hitting the ball hard when he makes contact (CTBA has been over .360 in each of the last four years). Adames does need to improve his K rate (22.9). Even with above-average speed, Willy has a poor success rate (62.0) stealing bases. His overall talent does point to more upside with a top of the order bat. He looks like one of those players who will be much better in the majors than his minor league resume. With a full season at AAA, Adames looks poised to make the jump to the majors. Only a neutral hitter out of the gate with possible a 15/15 skill set. He’s backend flier as his game could come quicker than expected. Tampa acquired Arroyo over the winter from the Giants in the trade involving Evan Longoria. Over five seasons in the minors, Christian hit .300 with 24 HRs, 208 RBI, and 18 SBs over 1491 at-bats. He struggled in limited at-bats (125) in the majors in 2017 (.192 with three HRs and 14 RBI). His K rate (14.9) had strength in the minors while needing more work in the majors (23.7). He won’t take a lot of walks (5.8 percent in the minors). For now, he’s a light power-hitting corner infielder with a very good swing at the plate. His batting average projects well while needing more bulk and strength to deliver impactful home runs. This year he could earn the starting job at SS or 3B for the Rays. His skill set would play better as a middle infielder in deep leagues. Jesus Sucre (C) – Sucre did a nice job for Tampa as the backup catcher in 2017. He hit .256 over 176 at-bats with seven HRs, 35 RBI, and two SBs. Over five years in the majors, Sucre hit .229 with nine HRs and 49 RBI over 415 at-bats. He has no Fantasy value other than a $1 second catcher in AL-only leagues. Joe Wendle (2B) – Despite hitting .285 with 30 HRs, 172 RBI, and 39 SBs over the last three seasons at AAA covering 1,546 at-bats, Joe has been able to crack the major league code to get a chance at regular playing time. His walk rate (4.0) was extremely low at AAA with an above the league average K rate (18.6). Over the last two years with 109 at-bats in the majors, Wendle hit .266 with two HRs, 16 RBI, and two SBs. He’ll compete for a bench role in March. Archer has underachieved in ERA (4.02 and 4.07) over the last two years despite being electric strikes outs over the last three years (734 Ks over 614.1 innings). Last year Chris matched his career best in walk rate (2.7) while setting a career high in his K rate (11.1). After eight starts, Archer had a 3.04 ERA with 59 Ks over 53.1 innings. His game fell off over his next 11 games (4.65 ERA with 88 Ks over 69.1 innings) with some struggles with HRs (9). Over ten starts after the All-Star break, Chris went 2-3 with a 3.36 ERA and 78 Ks over 56.1 innings. Two disaster games in September (11 runs and 19 baserunners over 6.2 innings) pushed his ERA back over 4.00. Archer was very good against righties (.232 ERA) while needing to find his out pitch vs. LH batters (.263). He did have almost equal success against RH (.244) and LH (.231) hitters in 2016. HIs AFB (95.7) remains an edge, but his slider rate (44.4) continues to rise. This high number may lead to an elbow issue down the road. Batters only hit .212 against his slider with 13 HRs in 463 at-bats. He barely threw his changeup, which was easier to hit .340 BAA) compared to 2016 (.271). He pitches in a tough division (BAL – 5.91 ERA, BOS – 5.87 ERA, and NYY – 4.24 ERA), which is a big part of his out of line ERA. Tampa won’t compete for the division title this year leaving Archer with another less than exciting win total. His overall skill set gives him a chance at a sub 3.00 ERA with repeated command and 250+ Ks. For a young pitcher to have success in the majors, he needs to learn to get ahead in the count. The best pitchers in the game will throw 67 percent first-pitch strikes while the league average is about 62 percent in most seasons. Last year Snell only threw 53.8 percent first-pitch strikes, but he did improve on his 2016 walk rate (5.2 – 4.1 last year). Batters only hit .234 against him with his best success coming against lefties (.182 with no HRs over 66 at-bats). Blake pitched his way out of the majors after first eight starts (4.71 ERA) plus the Pirates lit him up for six runs and nine baserunners over five innings when he was called back up in late June. Over his last 14 starts, Snell started to look like a major league arm (3.49 ERA with 74 Ks over 77.1 innings). His walk rate (2.9) moved into a much stronger area. He put a stamp on 2017 with an electric performance in his last start of the year (no runs and two hits over seven innings with 13 Ks). At AAA in 2017, Blake had a 2.66 ERA with 61 Ks over 44 innings. Over seven seasons in the minors, he has a 41-29 record with a 2.81 ERA and 618 Ks over 529.1 innings. His AFB (94.7) continues to improve. Batters struggled to hit his four-seam fastball (.237 BAA), slider (.213 BAA), and curveball (.173 BAA) while his changeup (.260 BAA) still needs work. All the tools to be an elite arm, but he needs to throw more strikes. Right kind of bet in 2018 with excellent chance to reach 180+ innings with a sub 3.50 ERA and 200+ Ks. In the running to be a breakout pitcher of the year in the American League. Faria was a nice waiver wire pick up in 2017, but his season was just about over in mid-August after suffering a abdomen issue. Over his first 13 starts in the majors, Jacob had a 3.32 ERA and 1.195 WHIP with 77 Ks over 78.2 innings. He made three short appearances over the last two weeks of the year (four runs and eight baserunners over eight innings). HIs AFB (92.0) was below the league average while batters struggled with all of his off-speed stuff (slider – .224 BAA, changeup – .151 BAA, and curveball – .100 BAA). Faria owned lefties (.173 BAA) even with a poor BB:K ratio (21:24 over 98 at-bats). Over seven seasons in the minors, Jacob has a 41-32 record with a 3.13 ERA and 626 Ks over 599 innings. He pitched well at AAA in 2017 (6-1 with a 3.07 ERA and 84 Ks over 58.2) while dominating at two levels in 2015 (17-4 with 1.92 ERA and 159 Ks over 149.2 innings). He won’t dazzle you with his fastball, but his secondary stuff is tough to hit with K ability. Nice value arm in 2018 while needing to show growth in his command. Ready for a full season of work in the majors. Faria should win 10+ games with a sub 3.75 ERA and 175 Ks if given 30 starts. Eovaldi missed all of the 2017 season with a right elbow injury that required surgery in August of 2016. Last season he made a couple of appearance in September for the Durham Bulls putting on track to compete for a starting job this spring. Over his last two seasons with New York, Nathan went 23-11 with 4.45 ERA and 218 Ks over 279 innings. HIs K rate (7.0) with the Yankees was the best of his career while his walk rate (2.9) fell in line with his career average. The signal for his elbow surgery came from the spike in his HR/9 rate (1.7) in 2016. Even with a big fastball (98.0 in 2016), he’s too easy to hit (.272 in his career). Batters struggled vs. his split-finger fastball (.219 BAA) and cutter (.167 BAA) in 2016 with doing a better job with his four-seam fastball (.269). Over six years in the majors, he has a 38-46 record with a 4.21 ERA and 539 Ks in 739 innings. There’s more here than meets the eye, but Eovaldi needs a swing and miss pitch to move him to the next level. Pretty much a free swing if his spring training reports are positive in March. Update: The trade of Jake Odorizzi and the injury to Brent Honeywell opens the door for Eovaldi to begin the 2018 season in the Rays’ starting rotation. Over five seasons in the minors, Banda has 40-34 record with a 3.83 ERA and 625 Ks over 644.2 innings. In two seasons at AAA, he went 12-11 with a 4.74 ERA and 184 Ks over 195.2 innings. His walk rate (3.3) is below major league expected value with a playable K rate (8.7). In 2017, Anthony struggled at both AAA (5.39 ERA) and the majors (5.96). His AFB (94.4) was a plus in the majors. His four-seam fastball (.211 BAA) and curveball (.174 BAA) graded well with the Diamondbacks with a losing fell for his changeup (.368 BAA). His next step is improvement in his command and changeup. In 2018, Banda looks positioned to be a viable option the majors. Follow him closely to see if he’s throwing more strikes in spring training. Update: The trade to Tampa does create a better starting opportunity for Banda in the majors. Anthony should have a higher ceiling than Yonny Chirinos, but his higher walk rate will invite job loss risk earlier in his career in the majors. 2017 was a lost season for De Leon. His season started with a right forearm issue that led to a DL stint in the minors. He pitched poorly in his three starts at AAA (nine runs and 20 baserunners over 14 innings) plus a failed outing in the majors (10.13 ERA). In June, Jose was back on the DL with a lat injury and later in the season he missed time due a right elbow issue. Over five seasons in the minors, he has 25-15 record with a 3.32 ERA and 490 Ks over 369 innings. 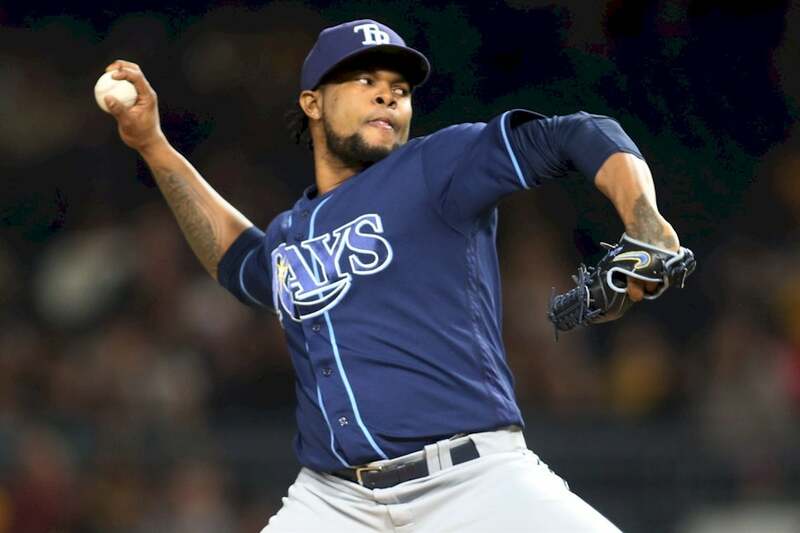 His lack of health last year puts him behind a few arms vying for a starting job in the majors with Tampa De Leon had an issue with his forearm and elbow in one season suggesting possibly TJ surgery with another setback. HIs K rate (12.0) is electric in the minors with solid command (2.8 walk rate). Player to watch this spring, but he’s far from a slam dunk in 2018. Over five seasons in the minors, Chirinos has a 36-17 record with a 2.75 ERA and 363 Ks over 474.1 innings. His success is driven by elite command (1.4 walks per nine) while offering low upside in Ks (6.9 per nine). Last year Yonny handled himself well at AAA (12-5 with a 2.74 ERA and 141 Ks over 168.1 innings with some growth in his K ability (7.7). Chirinos offers a four-seam fastball, a sinker, a change, and a slider. His growth in 2017 was due to the development of his slider. Yonny doesn’t have an impact pitch or plus velocity, so his success will come from his strike throwing ability. The injury to Brent Honeywell does clear the door for an early call up to the majors if he doesn’t make the majors out of spring training. Viable bench option in AL only leagues. Chirinos will have his chance to pitch in the majors in 2018. Over four seasons in the minors, Honeywell is 31-19 with a 2.88 ERA and 458 Ks in 416.0 innings. His command is excellent (2.0 walk rate) with an improving K rate (9.9 in his career – 11.3 in 2017). Brent should be in the majors in 2018 after making 24 starts at AAA (12-8 with a 3.64 ERA and 152 Ks over 123.2 innings). The Rays selected him in the second round in the 2014 MLB June Amateur Draft. Honeywell has very good command of his two and four-seam fastballs, which ranges from the mid to upper 90s. His changeup has a chance to be a plus pitch. Brent’s best pitch is a screwball while his curveball is still a work in progress. Excellent upside arm who was a bit easier to hit last year even with gains in his K rate. He looks locked and loaded to be in the starting rotation in early April as the replacement to free agent Alex Cobb. With 170 innings pitched, Brent should strikeout 175+ batters while offering value in both ERA and WHIP. Update: Honeywell is out for the season with a right elbow injury that required surgery. Colome led the AL in saves (47) in 2017, but it wasn’t a smooth ride for Fantasy owners. He had a decline in his walk rate (3.1) and K rate (7.8) with a job loss run in late June (ten runs and 16 baserunners over five innings). Prior to his fade, Alex had a 1.95 ERA, 29 Ks, and 19 SVs over 32.1 innings. Somehow, he regained his form over the last three months of the season (2.15 ERA, 24 Ks, and 24 Ks over 29.1 innings). Colome held the biggest edge over lefties (.190 BAA) despite issuing 14 of his 23 walks. For him to keep the 9th inning long term, he needs to be better against RH batters (.272). HIs AFB (95.4) fell in line with his career resume, but batters hit .369 against it (.280 in 2016). Last season he threw his cutter 67.3 percent of the time with elite success (.182 BAA). Over two seasons in the majors, Alex converted 84 of his 98 saves. His lack of flash in Ks will push him further down the closer chain, but he could very well end up with elite save chances again this year due to Tampa offering low scoring ability leading to many close games. His cutter is tough enough to hit to believe in a bounce back in his skill set and 40+ saves. Buy the saves and hope for league average reliever Ks (75). Hu had a successful season at AA in 2016 (2.59 ERA with 107 Ks in 142.2 innings), but Tampa decided to switch him to a relief role last season. His stuff played well (4-1 with a 3.06 ERA and 57 Ks over 61.2 innings) leading to a call up to the majors. His only negative was a spike in home runs allowed (1.3 per nine innings). Over five years in the minors, he has a 2.79 ERA with 373 Ks in 425.2 innings. Hu allowed three runs over ten innings in the majors with nine Ks, but he did walk four batters and allow a pair of home runs. Chih-Wei’s fastball came in at 93.7 with Tampa. Batters struggled to hit his changeup (.077) while needing to do a better job with his sinker (.375 > short sample size – eight at-bats). The Rays’ bullpen will be in transition in 2018 giving Hu a good short of being involved in the 7th or 8th inning. His short resume and slight risk in home runs will invite some disaster games early in his career. Possible bench flier in an AL-only league. Alvarado made the jump from AA to the majors in 2017. Tampa gave him a couple of chances in the starting rotation in rookie ball in 2013 and 2014, but his lack of command led to a switch to the bullpen after missing most of the 2015 season. In 2016, he walked 7.0 batters per nine innings. Last year in the minors his walk rate (5.5) improved along with his K rate (12.1) leading to call up to the majors. Jose has a special fastball (98.6) and his curveball is extremely tough to hit (.037 BAA). Somehow the Rays were able to iron out his mechanics in the majors leading to a huge improvement in his walk rate (2.7). Alvarado was very good against righties (.156 BAA) while needing help solving LH batters (.298 BAA). Big bodied pitcher with two plus pitches when throwing strikes. If he can find his command and add a third pitch of value, Jose may find himself in the starting rotation down the road. For now, an upside lefty reliever with his success tied to his ability to throw strikes. CLICK HERE TO LERN MORE ABOUT THE DEVELOPMENT OF SCOUTscores!